Calder ‘76 boss Rob Kenworthy doesn’t dare to believe that his side has turned over a new leaf after last Saturday’s fine start to 2015. 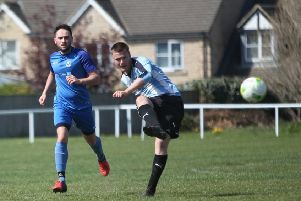 Kenworthy’s men were 3-2 home winners over champions Ryburn United in the Halifax AFL’s top flight, having had their commitment questioned by the manager following a cup exit to Warley in their last game before Christmas. Ricky Topham’s sweetly-struck shot with six minutes left Calder two places to eighth in the Premier with 14 league left. Kenworthy reckons he has a good idea how his side is going to perform before kick-off and knew his players were up for Saturday’s game. “I could see it in their eyes,” he said. Calder travel to in-form Northowram this weekend and Kenworthy is hoping for a repeat display. In heavy conditions, both sides scored a scrappy goal from a corner in the opening three minutes. Ryburn drew first blood when the ball rebounded in off home midfielder Simon Stansfield but Sam Taylor equalised after Topham had challenged ‘keeper Matt Hirst. Calder took the lead when Topham’s good work set up Jonny Gibson, back after an ankle injury. However, speedy Joe Swallow made it 2-2. There was little in it after the break, although Calder arguably created the better chances with Hirst making a good save from Gibson. Topham put one over the bar and when he hit the woodwork from the spot after being tripped in the 70th minute it looked as if it was not going to be his day. Kenworthy thought the player wanted to come off but felt his general play had been good and stuck with him. And Topham duly accepted his toughest chance of the day. It became a double celebration when news filtered through that Calder Reserves had won 3-0 away to Ryburn Reserves in Division One. Goals from Gav Martin, Matty Marsden and John Moynes gave Calder victory and they also missed a penalty. Moynes’ goal was apparently a ‘belter’ and Kenworthy said: “If he scores a tap-in it is the goal of the season. Two more goals from Lewis Cockroft was not enough to stop Hebden Royd Red Star losing 3-2 away to Greetland. Tom Wall scored a hat-trick for the hosts but Star might have grabbed a point from a backs-to-the-wall effort. Wall lashed home the opener after 20 minutes after the visitors had attempted to head clear following a corner. Wall lost his marker to fire in a second but Cockroft got one back from the penalty spot before half time after he had been brought down. Will Boylan and player-manager Chris Garbutt performed heroics as Star hung on under pressure. Wall eventually got his third but Garbutt’s hit-and-hope punt was patted out by the ‘keeper to Cockroft, who headed home. There were chances at both ends late on with Tom Garland off target for Star. Saturday’s fixtures - Division Premier: Copley United v Stump Cross, Midgley United v Hebden Royd Red Star (P.Bowe), Northowram v Calder 76 (I.Childs), Ryburn United v Greetland AFC, Shelf United v Elland United, Warley Rangers Halifax v Sowerby United. Division One: AFC Crossleys v Hx Irish Centre, Calder 76 Res v Stainland Utd (TBA), Denholme Utd v Volunteer Arms, Elland Allstars v Sowerby Bridge (M.Rhodes), Greetland Res v Midgley Utd Res (S.Bragg), Holmfield v Mixenden, Salem v Ryburn Res. Division Two: Hebden Royd RS Res v Brighouse Sports (D.Sutcliffe), Illingworth SM v Shelf Utd Res, Shelf FC v Denholme Utd Res, Sowerby Bridge Res v Northowram Res, Sowerby Utd Res v West Central (P.Higgins), St Columbas v Salem Res (C.King).